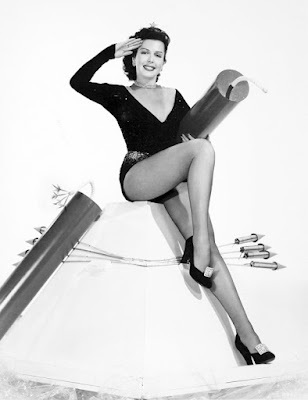 On many holidays I post classic pinups to A Shroud of Thoughts. 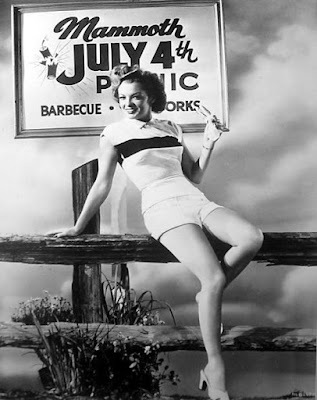 Today being the 4th of July, then, here are some classic, patriotic pinups. First up is Myrna Dell, who is relaxing on a fence! 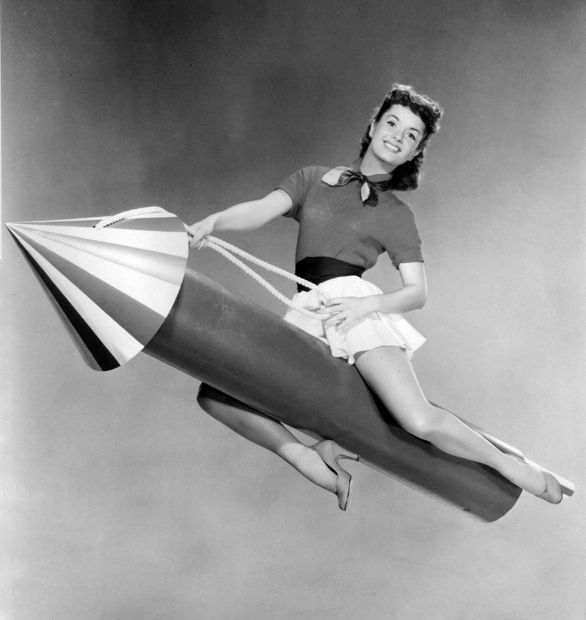 Next up is Mary Castle, who is setting off a cannon! 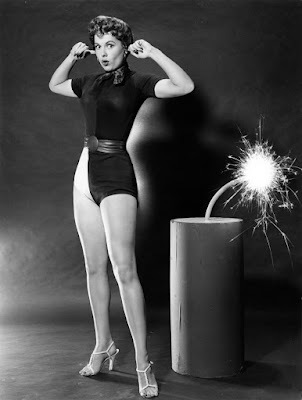 And here is Martha Hyer, who has lit a really big firecracker! Debbie Reynolds is riding a rocket. And here is Ava Gardner flying the American flag. And last but not least, it wouldn't the 4th of July without Ann Miler! This month every Monday and Tuesday TCM Spotlight is featuring 50 different movies, one set in each state, as well as a movie set in Washington D.C. (Mr. Smith Goes to Washington, of course). Turner Classic Movies will be airing some truly great movies, including some of my favourites. I am very happy that to represent Missouri they are showing Meet Me in St. Louis (1944). The neighbouring states of Illinois and Iowa also got lucky as far as the movies representing them go (also two of my favourites): The Front Page (1931) and The Music Man (1933). That having been said, some of TCM's choices do seem a bit odd to me. King Kong (1933) is one of my all time favourite movies (it is in the top ten), but I think more of it is set on Skull Island than the state of New York. And, quite honestly, while The Graduate (1967) is set in California, I don't think of it as a particularly Californian movie. Indeed, the plot could take place anywhere. For California I would have gone with Vertigo (1958) or L.A. Confidential (1997). Of course, I have to admit that if I had been in charge of choosing movies for 50 Movies in 50 States some of my choices might seem odd to a lot of people. I would have gone with The Haunted Palace (1963) instead of Little Women (1933) for Massachusetts. I feel I have to apologise to Massachusettsans, but when I think of their state I tend to think more of H. P. Lovecraft than Louisa May Alcot! Anyway, be sure to check out 50 States in 50 Movies on Turner Classic Movies every Monday and Tuesday in July! I am not Canadian, but I do have plenty of Canadian friends and I have always had a soft place in my heart for Canada. I then thought today that I would do what I do on many holidays, post pictures of classic movie actresses. Sadly, Canada never did produce much in the way of patriotic pinups, but they did produce a number of beautiful and talented actresses. In fact, a number of actresses that many assume are American were actually born in Canada! Fifi D'Orsay was born in Montreal, Quebec and later performed in Paris. Not surprisingly then, she was often cast as a French girl! She appeared in such films as Those Three French Girls (1930), Wonder Bar (1934), and Wild and Wonderful (1964). She would later guest star on such shows as Perry Mason and Pete & Gladys. The woman most often credited as the world's first scream queen, Fay Wray, was born in Cardston, Alberta. 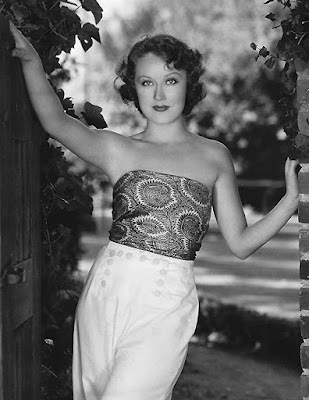 Although best known for her iconic role as Ann Darrow in King Kong (1933), she appeared in many other notable movies, including Doctor X (1932), The Most Dangerous Game (1932), and Tammy and the Bachelor (1957). Yes, the legendary Deanna Durbin was Canadian! In the Forties her movies were so popular that she is often credited with single-handedly keeping Universal afloat during those years. She was born in Winnipeg, Manitoba. The general public may know Yvonne De Carlo best as Lily Munster, but classic film buffs know she made a number of movies and was one of the most popular pinups of all time. She appeared in such films as Salome, Where She Danced (1945), The Desert Hawk (1950), Sea Devils (1953), and The Ten Commandments (1956). Her film career was still doing relatively well when she took the role of Lily on The Munsters. The year before the show debuted she appeared in McLintock! (1963). Dianne Foster appeared in such films as The Kentuckian (1955) and The Brothers Rico (1957), but she may be best known for her many appearances on television, including guest shots on Bonanza, Wagon Train, Thriller, Route 66, The Wild Wild West, and several on Perry Mason. 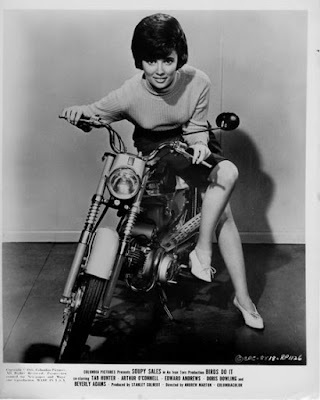 A native of Edmonton, Alberta, Beverly Adams may be best known for appearing in the Matt Helm movies The Silencers (1966), Murderer's Row (1966), and The Ambushers (1967). She also appeared in such films as How to Stuff a Wild Bikini (1965) and Winter A-Go-Go (1965). She retired from film acting in 1967, but would do occasional guest appearances on TV shows such as CHiPs, Silk Stalkings, and Profiler.